Welcome to Senior Year Saturday, a regular feature here on Musings From Neville’s Navel! Essentially, I talk about any and all things related to my final year of high school, from homework and extracurriculars to updates on college planning and thoughts on graduation. And more! (Such as that dreaded feeling known as “senioritis.”) Enjoy! Hello there! 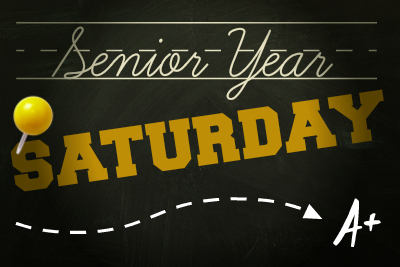 Since I graduated yesterday, this will be my very last Senior Year Saturday post… so I thought this would be a great opportunity to recap my previous SYS posts! And then at the end of this post I’m going to discuss a variety of other things related to my senior year, so… yeah. Enjoy! My first SYS post was about GOALS. I didn’t accomplish many of these, actually, but I’m trying not to feel too bad about it because some of those activities are things that would probably be more fun in college, anyway: Joining a GSA and job-shadowing at a newspaper and whatnot. I did remember to do some of the other things, though, such as applying to a bunch of scholarships. The only goal I’m disappointed about not completing is “reading at least seventy-five books during the school year,” but hey. Reading slumps happen, and that’s OK. Towards the very end of August, I recapped my first week back in school. I was so busy then! But it was a lot of fun, so I didn’t mind. In late October, I listed five schoolish things I’d done that week. I talked a little bit about homeschooling, a little bit about dual-credit classes (that I finished just this past week), and a little bit about college stuff such as applying for housing. It was kind of fun to reread this post and remember that week! I discussed the subjects I studied during the spring semester: Spanish, comm, statistics, astronomy, and American literature. Out of those five courses, my favorite was definitely comm – I learned so much and my confidence in my public speaking abilities grew by leaps and bounds! At the beginning of the spring semester I thought I’d hate that class, but in the end I’m so glad I took that subject. Ah, senioritis. That dreaded affliction. I hoped to avoid it, but I… didn’t. I so didn’t. I can’t wait until college, when everything will be new and different! So. Senior Year Saturday. I really enjoyed creating that regular feature, and writing posts for it, and whatnot. It’s been fun to reread those old posts and remember everything that happened during my senior year of high school! I may not have written as many SYS posts as I’d originally planned on – I wanted to write around twenty or so, but I ended up writing eight – but that’s OK. I do feel like I have a much more complete record, blog-wise, of what went on than I do for some other school years. Which is nice. Anyway, now I’d like to know what you thought of all my SYS posts! Did you like them? Do you have any suggestions relating to things differently? Because I’m thinking about writing a similar series of posts for college… so let me know what you think of THAT particular idea, as well! Are there any college-y topics you’d like me to blog about? Be sure to let me know in the comments section below! What’s happened recently in your life? Anything exciting? Any schoolish thingies? Read any good books lately? I’d love to know! This entry was posted in Homeschooling, Nevillegirl's Adventures!, Non-Neville Posts, Uncategorized and tagged high school, homeschooling, my life, senior year, Senior Year Saturday, teen. Bookmark the permalink. Yay, OK! 🙂 I won’t be able to post nearly as often once I’m in college, but I will definitely try to write occasional updates! You should start a college life series! I’m still stuck in school, so I’d love to read that – especially because I like your writing style.